Since you last saw me (slash heard from me) 3 months ago, I have been working diligently to tackle my injury(s) and get faster. Luckily, my diligence has truly paid off in both areas as I find myself pretty much free of any signs of tendonitis and I’m averaging a pace that has steadily been around 30 secs- 1 min faster than what I was running a year ago. It’s important to illustrate my training because you will see shortly that it came to good use in my most recent 10K. I’d hoped to finish the 10K in 65 minutes (10:30 pace). That’s the pace I’ve been consistently running in my 4 mile training runs during the week. The 85 degree weather kept me a little slower than I’d liked but despite this, I seemed to be keeping up nicely with a rather fit 50-ish man who I’m just gonna call Bob for the purposes of this story. So eventually, Bob kept going as fast as he could in order to keep as much distance as possible between us. And when he was just a little white dot, I finally put him out of my mind and kept on with my modest race. 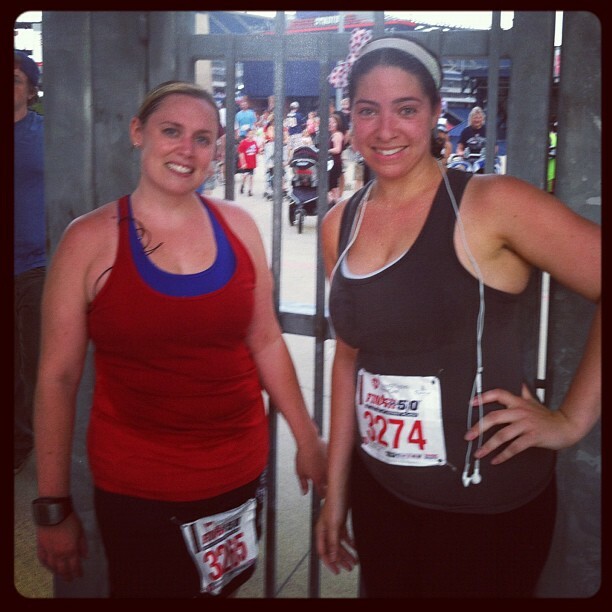 It was hot, it was humid, it was tough. I found myself itching to find that 5-mile marker, the one that would tell me I was almost done. When we came upon that final mile marker, my training instincts kicked in. Before I knew it, I was running close to a 9 minute/mi pace (or possibly faster). I passed runners left and right, dodging in and out of crowds as if I were speeding on the highway. I kept that pace for that final mile until lo and behold! There was Bob. Right next to me on the left- and out of gas. I thought to myself: Maybe. Just maybe. I could beat Bob. I didn’t know how far I had left. I figured it was about 2 tenths of a mile so, as I did in training, I started sprinting as fast as I could. I knew I could hold my sprint pace for 2 tenths. However, as soon as Bob saw me, he started sprinting as fast as he could, too. We reached the Gillette parking lot and I thought we were home free. I was going to win this race. Unfortunately, the finish was deceiving as I soon realized that we had not TWO, but FOUR tenths left. And there was Bob, right beside me, sprinting with all his might. All I could do was back off to try to regain some energy. And when I did, sure enough, Bob followed suit. It became clear to me, he wasn’t trying to finish fast. He was just trying to finish before me. So I came up with a new strategy. Stay as close behind him as possible and as soon as we reach the field, book it to the finish line. So as soon as my feet reached the green, I went all in. And Bob did the same. However, deceit #2: there were still 50 yards left to race once you entered the stadium. Sadly I started sprinting too early. And as I tried as hard as I could to sprint the last 50 yards, I just did not have enough to pass him. Bob beat me by 13 seconds. And I sprinted my way to nearly vomiting in the recycling bin. Despite the fact that I lost to this nincompoop, I am pretty proud of my finish in this race. I was probably about a half mile behind Bob at the point where I picked up my pace and eventually caught up to him. Had I strategized a little better, I might have, in fact, beaten the guy 6 inches taller and seemingly much more fit than I. But I digress. Ultimately this race was never about Bob. It was about me proving to myself that I could actually RACE. And I did just that. ← Mile by Mile- A Battle to the Finish. Omg this Bob sounds like such a loser! You go girl!